Jill Heinerth will be the keynote speaker at Celebrate Water Door County’s 2019 Water Summit, held at the Landmark Resort in Egg Harbor. Along with Heinerth, Dan Egan, author of The Death and Life of the Great Lakes, will lead a conversational discussion during lunch. These two are just a few of the people who will lead discussions throughout the three-day summit. 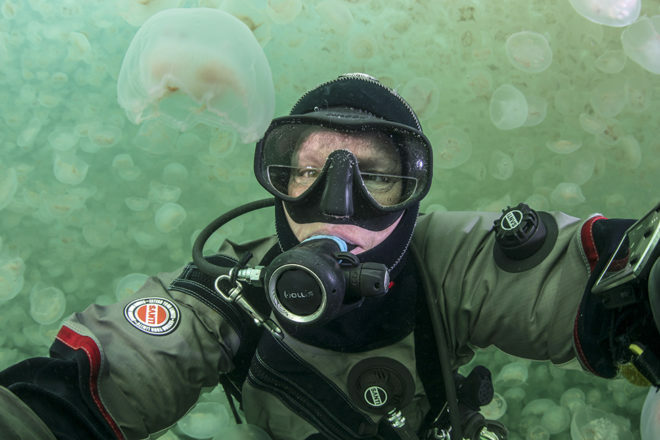 Heinerth is a Canadian cave diver, underwater explorer, writer, photographer and film-maker. She serves as the inaugural Explorer in Residence for the Royal Canadian Geographical Society. 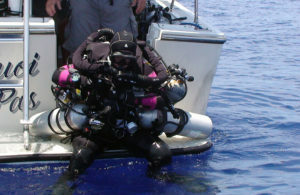 Other awards and accolades include induction into the Explorer’s Club and the inaugural class of the Women Diver’s Hall of Fame, the Wyland ICON Award, named a “Living Legend” by Sport Diver Magazine, was selected as “Sea Hero of the Year 2012” by the Scuba Diving Magazine, and was awarded the inaugural Sir Christopher Ondaatje Medal of Exploration. 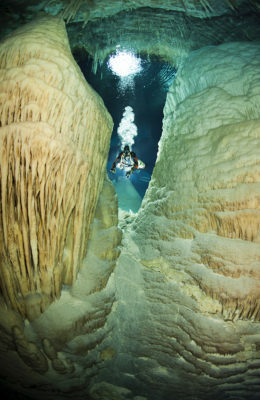 In 1998 she was part of the team that made the first 3-D map of an underwater cave. Heinerth was the first person to dive the ice caves of Antarctica, and has dived deeper into caves than any other woman in history. She is an advocate for clean water and understanding the fragility of this resource. Her interests are varied and she has had her hands on projects of all kinds. As Administrative Coordinator of Celebrate Water, I sent Heinerth a few questions to learn more about her and her various projects. Grace Johnson (GJ): What attracted you to diving? Have you always envisioned yourself in the position you are in today? Jill Heinerth (JH): I was a real water baby, but watching the Apollo missions on TV made me want to be an explorer. 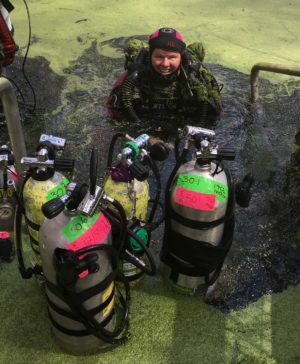 My first career was in advertising as an owner of a graphic design company in Toronto, but my love of scuba diving led me to find a way to be creative in the underwater world. My career was more of an evolution than a decision, but today, I pinch myself every day. I am doing what I love. GJ: One of your projects is Women Underwater: The Comprehensive Guide for Women in Scuba Diving. What was it like starting out as a female in a male-dominated field? Have you experienced discrimination or special treatment because of your gender? If so, have there been improvements throughout your career? What do you do, or try to do, to work past these potential blocks? JH: I was, and still am, often the only woman on a project. Discrimination is not as bad as it was 30 years ago, but it still exists. There are examples of intentional and unintentional misogyny. I realize that I have to be assertive to get the job. There are times when people look past me to the next qualified man without ever considering that I want a position or am qualified for a position. I have had to work hard to be noticed. I try to excel at everything I do but I also think of myself as a brand. I have to sell my abilities and ask for the gig when I want it. GJ: Is there a place you have always wanted to dive, but have not had the opportunity yet? Do you have a favorite dive experience? JH: I would love to visit the Cocos Islands where hammerhead sharks and giant manta rays number in thousands and circle deep ocean pinnacles in clear open water. Diving inside an Antarctic iceberg was one of the most memorable diving expeditions of my life. I was working on a National Geographic project, and was the first person to cave dive inside an iceberg. Since then, I have been drawn to the polar regions again and again to document climate change and loss of sea ice. I look at sea ice as an endangered species. It is just as important to film and photograph as dwindling populations of marine mammals. They are all endangered. GJ: Another project on your site that intrigued me is the documentary Real Sobriety. If you are willing, what brought you to this project in the first place? Are there elements of diving that you found connected to the struggle of sobriety? JH: When I met my husband over 13 years ago, he told me he had been “clean and sober” for over 20 years. I wanted to learn how to support his continued journey through life and he wanted to learn about filmmaking, so we started the Real Sobriety project that includes a documentary film and an ongoing podcast. I wanted to reach real people suffering from addiction but also offer tools to their family and friends about how to support others in sobriety. I’m really proud of Robert’s work in addiction and recovery. He has helped a lot of people through his coaching and support. GJ: What kind of advice would you give to someone who is interested in diving, but is hesitant to try, or wants to pursue diving as a career? JH: If you are afraid, that is good. Use fear to lead you to new and remarkable experiences. When you stand on the threshold of a dark doorway that terrifies you, try taking one step closer to the blackness. It is there that your eyes will slowly adjust and allow you to see something that pushes your envelope of experiences. On that edge, you are an explorer, and if you keep making small steps into the blackness then you will do something new and interesting for yourself or perhaps even something new and remarkable for humankind. Fear keeps us safe and shows us that we care about the outcome of our choices. Now on the practical end of your question – if you want to make diving your career, you will need to be self-directed and entrepreneurial. There is no single program or training out there. Your career will likely be a hybrid mix of specialties. For me, I am a writer, photographer, filmmaker, consultant, instructor, etc. All of those skills keep me in the water and doing things I love. Aside from her continued diving explorations, Heinerth is releasing a major market book in July 2019 titled Into the Planet, published by HarperCollins. For more information visit intotheplanet.com. 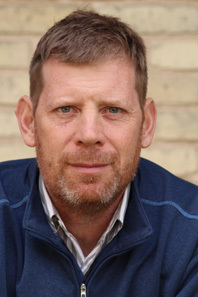 Dan Egan, author of The Death and Life of the Great Lakes, also joins the lineup for speakers. Egan is a reporter for the Milwaukee Journal Sentinel who has covered the Great Lakes since 2003, and a senior water policy fellow at the University of Wisconsin-Milwaukee’s School of Freshwater Sciences. He was a finalist for the Pulitzer Prize twice, and has won the Alfred I. duPont–Columbia University Award, John B. Oakes Award, AAAS Kavli Science Journalism Award. The idea for The Death and Life of the Great Lakes came about during a book-writing seminar at Columbia University’s journalism school. It is a New York Times bestseller, winner of the Los Angeles Times Book Prize, and the J. Anthony Lukas Work-in-Progress Award. It was also the April 2018 pick for the NewsHour-New York Times book club, Now Read This. Egan’s book will be one of two choices for the Door County Reads and the UW-Madison choice for their Go Big Read. In addition, it is required reading for UW-Madison’s incoming freshmen and law school students. Reviews of Egan’s book have all agreed that he has perfectly blended his journalism experience, science and history into a story that is easy to follow and understand, while staying captivating. He seamlessly weaves together the research of past articles into an epic story of the life and death of the Great Lakes. These two speakers and more will attend the 2019 Celebrate Water Summit. More information and speakers will be announced later. For more information on Celebrate Water, visit celebratewaterdoorcounty.org or find Celebrate Water on Facebook and Instagram.